Tales Of A Nomad: Kovalam- God's Own Beaches...!! My Best friend was getting married on the 31st of December 2009 in Thiruvananthapuram and I had to find a place to spend the New Year’s Eve. Kovalam was the first destination that flashed into my mind and I gave no second thoughts to it. I had asked many of my friends to join me; however after a lot of discussions and phone calls, the count was just 4. We boarded the new multi axle Volvo bus on December 30th night. These buses do travel at amazing speeds and the proof to the same is that we reached Thiruvananthapuram in 12 hours time. After attending the wedding we left for Kovalam by 31st late afternoon. It is hardly a half an hours drive from Thiruvananthapuram to Kovalam. The cheapest and the best option was the KSRTC and we had no qualms about it. Kovalam has three beaches namely Samudra beach, Hawa Beach and Light house beach. Not quite sure where to get down, we ended up at the samudra beach, not knowing that we should have got down much earlier for the Light house beach. We decided to walk from Samudra beach to Light house beach via the Hawa beach. It was approximately a kilometers walk and the hot sun was not helping us. Samudra beach is a calm, quite and secluded one. As we reached the Hawa beach we could see that the most famous one amongst the three was also the most crowded of all. Light house beach is where you have most of the resorts and had lesser crowd than Hawa beach. The name Light house beach comes from the fact that it has a light house towards the end. Pappukutty Beach resort on Light house beach is where we had made the reservations. The resort is right on the beach front with an amazing view of the Arabian Sea. There are a lot of resorts, restaurants, souvenir shops and ayurvedic massage centers for the tourists to explore. After a quick change we leaped into the Arabian Sea and had a lot of fun and playing in the waters. The beach is quite well maintained and the safe guards make sure that things are within their control. Being the holiday season I could see a lot of bikinis in different sizes and shapes on the beach and I had no option but to ogle. 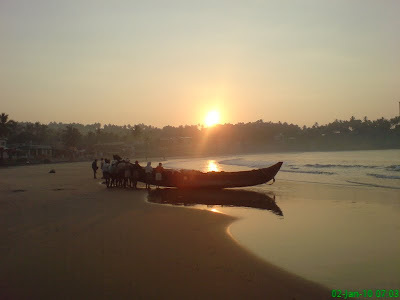 The firangis fly in huge numbers to this lovely beach town between the months of October and February. With the sun setting we headed back to the resort for the New Year’s party. The walkways were well lit up for the New Year’s Eve and had a lot of cops roaming around to make sure there were no hooliganisms on the beach. The shops and restaurants were open till late night and the people were swarming into them. Our resort had a rooftop dance floor and the party was all about boozing and dancing. With the clock striking 12, people started shouting, howling and wishing every other soul present there. The resort had a lovely pool and we couldn’t resist the temptation of jumping into it after the party. A dive into the pool after gulping down a few shots of whisky gives you a lovely sleep. Happy New Year 2010...!! Next day after breakfast we started the New Year’s morning with a lot of beach roaming and window shopping. After that it was time for us to fill our bellies with beer. January 1st was a dry day and to avoid the cops we were served beer in coffee mugs. With the beer flowing down my throat and sea breeze kissing my face I had an amazing high. We gulped down beer till the evening before heading into the sea again. After a dip in the sea it was time for a dive in the pool. We spent a lot of time swimming and playing in the pool. A tiring day came to an end with a good dinner (rice and fish curry) and a peaceful sleep. Got up early next day and headed straight to the beach to witness the sunrise. The beach was so calm and peaceful at the break of dawn. All I could see were a few joggers and the fishermen getting their boats ready for the day's catch. It’s a lovely sight to see the way the fishermen go about doing their work. We did want to do a bit of snorkeling but gave it a miss as there were no authorized people for it. After a bit more of roaming around the 3 beaches, we headed back to the resort and packed our bags. We had a lovely auto rickshaw ride from Kovalam to Thiruvananthapuram. From there my friends headed for Bengaluru and I caught a train to Cochin. Kovalam is one of the best beaches in India and the most famous tourist spot in God's Own Country. With a lot of good resorts, restaurants and ayurvedic massages available it is well recommended for all beach lovers. Signing Note : An amazing New Year with the 3Bs- Beach, Bikinis and Beer. What a cocktail...!! Thanks Panchali. Keep dropping by. Sounds like the perfect holiday and that was a perfect account of it too. Thank you Niranjan,i will keep it in mind for a holiday down south.